Bulldogs Go Back-to-Back - College Hockey, Inc.
Minnesota Duluth captures second consecutive national title. Parker Mackay’s goal less than four minutes into the game stood as the game-winner in UMD’s 3-0 victory. An impressive effort from start to finish lifted Minnesota Duluth to its second consecutive Division I men’s hockey national championship, the first repeat champions in the sport since 2004 and ’05. The Bulldogs opened the scoring less than four minutes into the game with a goal from tournament Most Outstanding Player Parker Mackay. They never looked back, shutting out Massachusetts, 3-0. Mackay’s goal came on the power play, taking a pass from Mikey Anderson on the left point to the front of the net. Mackay made a move and beat goaltender Filip Lindberg with a backhand at 3:51 of the first period. From there Duluth limited the Minutemen’s chances, blocking shots and keeping them to the outside. UMD finished with a 31-18 shot advantage on the night. Mikey Anderson and Jackson Cates added goals in the second and third, respectively. Cates’s insurance tally with 2:42 remaining essentially sealed the victory and allowed the celebration to begin among Bulldog faithful. 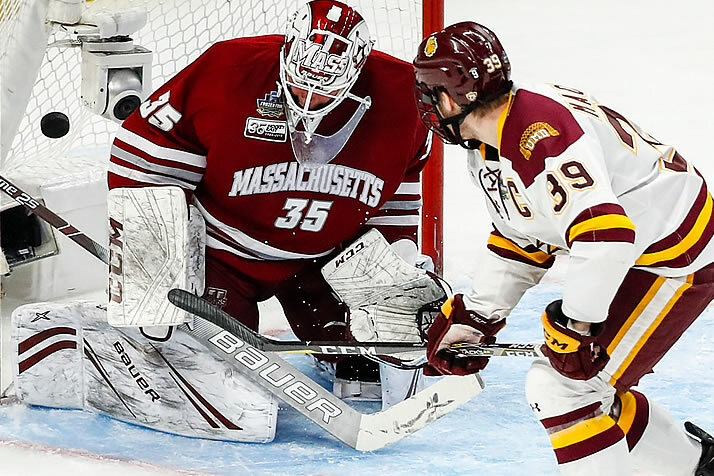 Massachusetts finished its season 31-10-0, just two years removed from a five-win season. The Minutemen simply couldn’t generate a sustained attack against UMD and goaltender Hunter Shepard. The loss likely ends the college career of UMass sophomore Cale Makar, the No. 4 overall draft pick of the Colorado Avalanche who could make his NHL debut in a matter of days. The Hobey Baker winner finished with 49 points this season, third in the nation. He wore his jersey to the postgame press conference and said that he didn’t want to take it off. Minnesota Duluth completes its season 29-11-2 and the first repeat national champions since Denver in 2004-05. It’s the third title in nine years for head coach Scott Sandelin and the Bulldogs, the only team to win multiple titles in that time. Only three coaches – Vic Heylinger (six), Murray Armstrong (five) and Jerry York (five) – have won more titles than Sandelin. In addition to the second straight title for Minnesota Duluth it marks the fourth straight for the NCHC, dating back to Denver in 2017 and North Dakota in 2016.